For a great way to spend Father’s Day with the family, one lucky New York Dad’s Blog reader can win a Family Four Pack to the Tigers – Tracking a Legend exhibit now open at South Street Seaport. Talk like a Tiger Interactive – Imitate the unique sounds of tiger cubs, the tigress and male tigers and get feedback by spectrogram showing how they match these tiger sounds. Electronic Digi-Track Climbing Wall for All Ages – Explore Interactive games using sensory Indian wildlife sounds & moving lights on the hand grips offering different games and degrees of difficulty. Encourage teamwork and fun through physical fitness/coordination. Inspires family & individual motivation by achieving game challenge goals. Carnivore Capture-Jaws/Claws & Canine Bite Force – Experience the Tiger’s Hunt through a dynamic touch sensory joystick link to animated HD simulation. Canine Bite Force engages visitors to hold onto a racer’s steering wheel feeling the resistance of eight different carnivore canine bite forces. Inside the Tiger Exhibit – Explore the tiger’s head, heart, chest and abdomen by viewing rare “CAT”Scans on a sliding monitor. Compare a tiger’s anatomy to a human’s anatomy. Tiger’s Cave and Conservation – Discover the Day in the Life of the Tigress and her two cubs and learn 20 Ways To Save Wild Tigers. – Go to Tigers NYC website and then tell me what fascinates you about tigers in a comment below. *ALWAYS give me a heads up in a separate comment below that you have done so otherwise it will NOT count as an additional entry. No more entries will be accepted after June 17th, 2010 at 11:59pm EST (date and time stamp on the comment). Open to US readers only. I will select the winner on June 18th, 2010 and they will have until 11:59pm EST to claim their prize. Just in time for Father’s Day weekend, one lucky New York Dad’s Blog reader can win two (2) tickets to see the New York Yankees take on the New York Mets at Yankee Stadium on Friday, June 18, 2010 at 7:05 p.m. (EDT) courtesy of Blimpie America’s Sub Shop. They are also going to send the lucky winner a $10 Blimpie gift certificate. Established in 1964 in Hoboken, New Jersey, by three high school buddies, Blimpie has been serving fresh deli-style subs for more than 45 years with freshly sliced meats, crisp vegetables, and an assortment of cheeses. They want to celebrate Father’s Day by giving away tickets to America’s favorite pastime. – Go to Blimpie’s website and tell me in a comment to this post which Blimpie Sub you want to try from their menu. No more entries will be accepted after June 15th, 2010 at 11:59pm EST (date and time stamp on the comment). Open to US readers only. I will select the winner on June 16th, 2010 and they will have until 5pm EST to claim their prize. Alright boys (and girls, why not?! 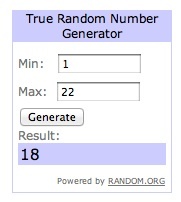 ), let’s get this inaugural giveaway started (so fingers crossed it goes smoothly)! Go to My Royal Heinie’s website and tell me in a comment to this post what other colors the wallet comes in (and if you feel so inclined let me know if you feel they are too girlie-man for you to be caught dead with while changing your kid’s diaper). Then again if you are a mommy that will not be an issue (guys let’s show the ladies that we have the numbers to beat them… after all, isn’t this the year of the daddy bloggers?!). No more entries will be accepted after March 19th, 2010 at 12am EST (date and time stamp on the comment). Open to US and Canadian readers only. I will select the winner on March 20th, 2010 and they will have 48 hours to claim their prize. You may ask how can I properly use the randomizer if I don’t have numbered comments? Well I do have them numbered, just can’t figure out (on this theme) how to do it so you can see it properly! So, you are just going to have to trust me on this one (and hopefully by the next one someone will mercifully show me the light!). PLEASE NOTE: You are required to submit valid e-mail addresses when leaving a comment (this will not be visible to the general public). By submitting your e-mail address for entry into this give-away you are consenting to my passing along your e-mail address to My Royal Heinie for marketing purposes. Please do not say that I did not tell you so because I just did (duh!). GOOD LUCK TO ALL (OK so a little more to the guys because we’re clearly outnumbered! )!